Joni, growing up on her father's sheep farm, meets Chess, a vegan animal-rights activist. Chess doesn't believe in keeping 'captive animals,' not even Joni's horse, and the adorable barn kittens. An uneasy friendship explodes when Chess 'rescues' two miniature horses, endangering their lives. Joni has to act before it's too late. Joni and Chess argue through issues of animal rights and farming, challenging and changing each other's points of view. A good mother-daughter book club book. "Joni . . . loves the quiet and calm of her family's sheep farm; she loves riding her pony, Archie, after school. But her best school friends don't live nearby, so when a new girl, Chess . . . moves (in) . . . she's intrigued by the possibility of a new friend. Chess loves Joni's horse, kittens, and sheep, but she asks uncomfortable questions: don't the sheep mind being shorn? Milked? Eaten? Joni doesn't know how to answer, but she does challenge Chess's interpretation of her neighbor's treatment of her miniature horses--Chess is certain their muzzles, which restrict them from overgrazing, are cruel, while Joni knows they keep the animals safe on lush pasture. When Chess steals the minis and sets them free to eat, the near disaster challenges their budding friendship . . . Joni's first-person voice is fresh and true. As always, Haas knows her horses, and she explores the issue of animal rights with sensitivity to both sides. A satisfying read." "I just loved this book! I'm not a horse person usually, but the ethical dilemma of animal rights versus the reality of farming life is so perfectly portrayed here. Readers will be fascinated by the implications of Chess's ignorance and the danger of misinformation. Both girls grow and change by the end of the book, and the conflict resolves in a very realistic way. This is a must-buy for all elementary and middle-school libraries; so many kids will find this interesting and engaging." "I could see this book being used as a great classroom or book club discussion book. It is thought-provoking; young and old could garnet great debate and stimulating discussion from group reading. Overall a great read for those needing a little bit of a mental workout once the pages have been turned." Fall is here. Geese are honking, acorns are dropping, and Bramble is having fun pretending to be afraid. Soon Maggie is really afraid. Why DO they call it Fall? Then comes Halloween, with scary costumes and the neighborhood transformed. Will it be Trick, or Treat, for Bramble and Maggie? Spooky Season is now a Candlewick Sparks paperback! Horses from prehistory to today, our ecstatic and tangled relationship with them, and their powerful effect on history, explored in many kinds of poems. 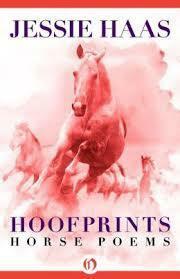 A world history told in poems about horses, from their beginnings as small spotted forest creatures, through the Ice Age, the first encounters with man, the wars, invasions, races, and intimate moments of our tangled lives together. In poems of all kinds, from very light to very serious, HOOFPRINTS explores the story of horses, from their beginnings as small spotted forest creatures, through the harsh Ice Age, the first encounters with early man, the first riders, the great invasions from central Asia, and the cultures that have grown up around this most romantic and practical of animals. Beware has been a first chapter book for many readers. I'm delighted to bring it back, with a great cover and illustrations by my sister, Martha Haas. 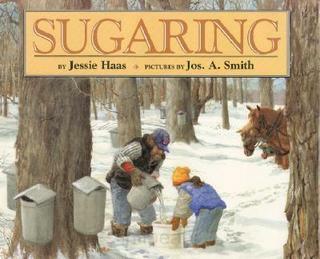 A boy, an elderly logger, and a draft horse named Nip find ways around their problems in rural Vermont. A Texas Bluebonnet Award nominee. 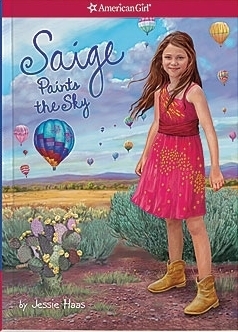 Saige, and Saige Paints the Sky, the story of Saige Copeland, an Albuquerque fourth-grader who loves art and horses, and finds out she has to fight for both. 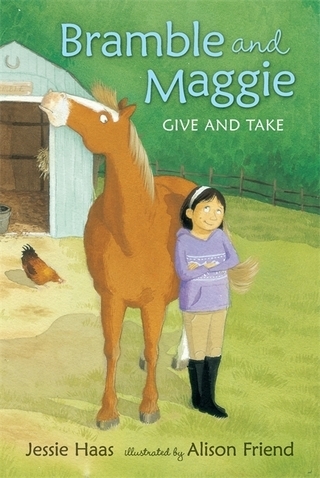 In Book One, Saige trains her grandmother's horse Picasso to do tricks--including painting!--as part of an arts fundraiser. In Book Two, she organizes a school protest. 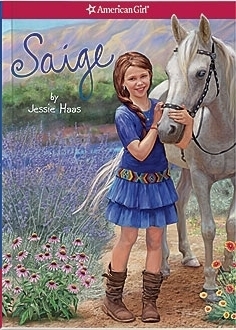 Saige also deals with a changing friendship, and an accident that changes life for her beloved artist grandmother, Mimi. Pure fun for horse lovers; horse crafts, horse lore, book and movie reviews, horse history, horse sports, horse breeds, and lots of ways for the (temporarily) horseless to use their horse models--well, models!--as they learn to draw, paint and photograph their favorite animal. These books are no longer in print. Many are available directly from me, from used book stores, or in your library. Jigsaw is an old pony who's trained many girls. But his latest has moved away and Jig is neglected, until he's noticed by a kind mail man with twin daughters. Is he a black pony with white spots? A white pony with black spots? And why won't he do everything Fran and Kiera ask? This chapter book for second grade readers was a Gryphon Award Honor Book, a prize given for books for readers transitioning into reading on their own. Third in the series that begins with RUNAWAY RADISH. Kirkus Editor's Choice "...one of the masters at the top of her game." Grandma Aggie always meant Popcorn to be Jane's pony, but Jane lives far away and Popcorn is a handful. So Grandma Aggie sells him--and then Jane comes to live nearby. When Grandma Aggie gets him back--just in time for Jane's birthday--he's still a handful. It some lessons from Tish and Radish (RUNAWAY RADISH) to teach Jane and Popcorn how to make each other happy. Molly and Anna have the perfect costume for the July 4th horse show costume class--but it depends on Scamper staying sparkling white, and both Scamper and nature are conspiring against them. When the skies open up on their patriotic crepe-paper costume, Molly and Anna learn to keep their chins up, and reap a big reward. "You smile at the good things, and you smile at the bad," Mom says, and readers will smile too. Back matter tells more about horse shows. Orphaned Harriet must go live with her stern aunt Sarah on a hill-farm in Vermont. How is she going to get to school, when Aunt Sarah doesn't believe school is necessary for girls? Can she train the excitable colt that is her only legacy from her mother? A sad, but ultimately uplifting story. "An emotionally rich and powerful tale of love, reconciliation, and healing." School Library Journal, starred review. "Haas's exquisitely crafted prose is the driving force in this heartfelt story of family ties..." Publisher's Weekly, starred review. "The powerful story of a resilient girl's moral awakening, UNBROKEN is set in 1910 in the Vermont towns and hill farms that Jessie Haas knows to her marrow, but it reverberates with universal meaning." I'm a regular writer for Green Energy Times. Read here about the awesome potential of healthy soil to sequester carbon, hold water, and build planetary health. DRAWDOWN, by Paul Hawken, is a powerful book detailing 100 proven strategies to reverse global warming. There's a place on this tug-of-war rope for everyone to take hold, and it's ideal for forming New Year's (or any time of year's) resolutions. Plastic shopping bags are becoming a thing of the past, but cotton totes are no carbon bargain either. Make your own reusable totes out of grain bags, bird seed bags, or pet food bags. The duct tape method is the one I prefer. Soil. It's not just a surface to stand on, or something to prop up plants. It is a living carbon sponge that greatly affects climate. 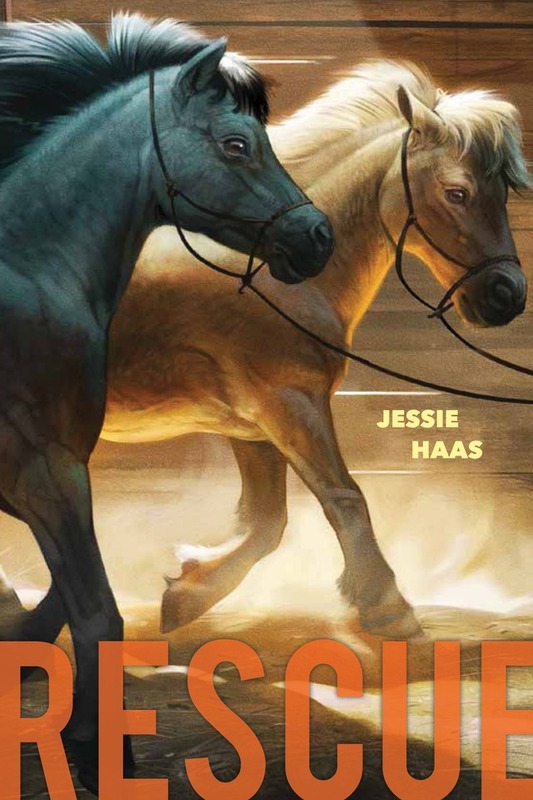 RESCUE is built around themes of the circle of life, the renewal of soil and spirit, and the deeply felt, deeply questioned ethics of working with (and sometimes eating) animals. I include it with my environmental writing for this reason. As Dad says, eating a piece of sheeps' milk cheese produced on the farm, "This is how we eat the grass." Or from Village Square Books, Bellows Falls, VT.
To find an out of print book, mail me--kjh@sover.net--to be sure the title is available. After we've made contact, mail me a check with the price of the book plus shipping. I'll sign the book and mail direct to you, or to the address of your choice. The Sixth Sense and many other titles now available as e-books from Open Road Media.